The Director-General of the BBC has outlined proposals to introduce an open market for programme-making at the corporation. 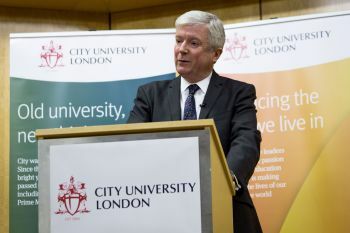 Speaking at City University London, Lord Hall said that the system which ensured that half of all BBC TV programmes were made in-house should end. He added that the BBC should be able to make programmes for other broadcasters in return. Lord Hall told the assembled audience of journalists, programme makers and academics that he wants to ensure a level playing-field between BBC producers and independent ones. "I want proper competition in programme supply, overturning the current system that no longer works as it should. I want a less regulated system that ensures that both our own BBC producers and those of the independent sector have creative freedom". "I want both a BBC production powerhouse that is a beacon for creativity, risk-taking and quality; and an amazing, world-beating independent sector. I want a system that supports British content and that keeps the UK competitive in a global market. And this competition is going to help make the BBC as efficient as any broadcaster in the country". The 'competitive revolution' would require changes to the BBC's Royal Charter and will not be introduced until it is renewed in 2017. Negotiations with the government about the renewal and the licence fee funding agreement are due to begin after the 2015 general election. "My aim in all this work is a world-class BBC. Not a low rent BBC. This is a crucial distinction and one that our most vociferous critics sometimes fail to understand. Value for money is what matters - not to be the cheapest, but the most efficient for the quality we are trying to achieve. The BBC must be judged on the work not just on its cost. We are competing in a commercial broadcasting market every minute of every day. That puts us in a different territory to other publicly funded services". John McVay, Chief Executive of Pact, the trade association which represents the commercial interests of UK independent media companies said the proposals were very welcome: "I think the licence fee payers, in years to come, will see this a seminal moment. We are the most competitive TV production industry in the world and the best programme makers will do well". Lord Burns, Chairman of Channel Four said they would consider airing programmes made by the BBC: "If they are good enough and they meet our remit then of course, but we need to ensure we maintain our vibrant, independent production market". The event also explored 'The Future of the Licence Fee'. Experts taking part in the speed debate included Lord Burns; Dame Colette Bowe, former Chairman of Ofcom; Louis Heinsman, Head of International Relations, NPO (Nederlandse Publieke Omroep); James Purnell, Director Strategy and Digital, BBC and Vicky Pryce, economist. Two further half-day seminars are to be held before the 2015 General Election looking at the different aspects of the BBC Charter Review. Lord Hall's speech is available to listen to on Soundcloud and you can follow the debate on social media using #CityBeeb.